You don’t have to look at many birds to realize that they are very variable in appearance: hawks look different from hummingbirds, and both look different from peacocks. You can spend a lot of time looking at birds, though, before you realize that they are hiding a lot of variation inside their mouths: long tongues, short tongues, spiky tongues, curly tongues, forked tongues, frayed tongues, brush-like tongues. Like bird bills, bird tongues are specialized to each particular bird’s way of feeding. Birds that feed on nectar have tongues specifically adapted to nectarivory, often with many little protrusions at the tip of the tongue, giving it a frayed or brush-like appearance. This brushiness increases the surface area of the tongue, making it better at picking up nectar. Hummingbirds go a slightly different route from other nectarivores. Rather than fraying their tongue into a paintbrush, they split it in two near the tip. 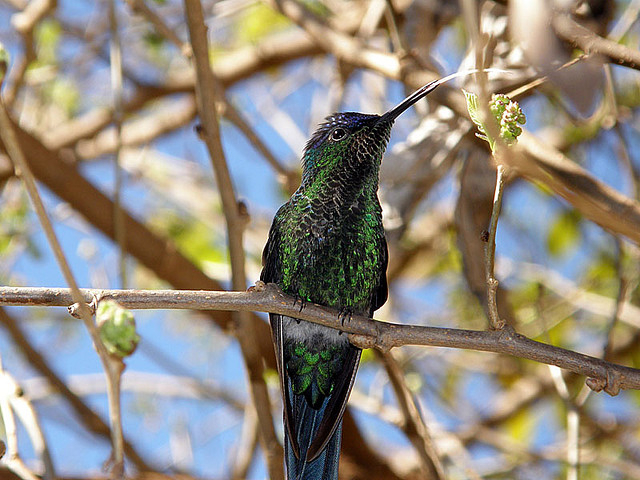 That’s right: hummingbirds have forked tongues. Green; shiny; has a long forked tongue: basically a snake. Each half of a hummingbird’s tongue is curled longitudinally. 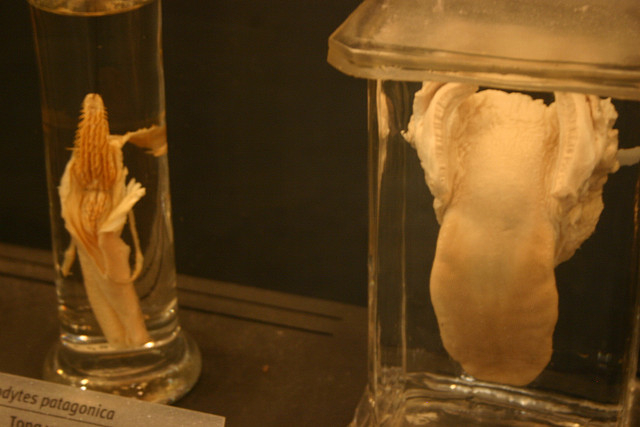 When the tongue is submerged in liquid, the tongue halves partially unfurl; when the tongue is withdrawn from liquid, the tongue halves curl up again. This means that as a hummingbird laps up nectar, it essentially has two tiny straws on the tip of its tongue that open up in the nectar, then curl closed as they are withdrawn, trapping the nectar inside. Even better, the furling and unfurling of the tongue is all due to physical forces, not muscles: the hummingbird doesn’t have to think about its tongue, it just laps up the nectar and physics does the rest (Rico-Guevara & Rubega 2011). Of course, this wouldn’t work if the hummingbird couldn’t stick its tongue out far enough to reach the nectar. Tongue stick-out-ability is another feature that varies a lot among birds. The champions are nectarivores and woodpeckers. 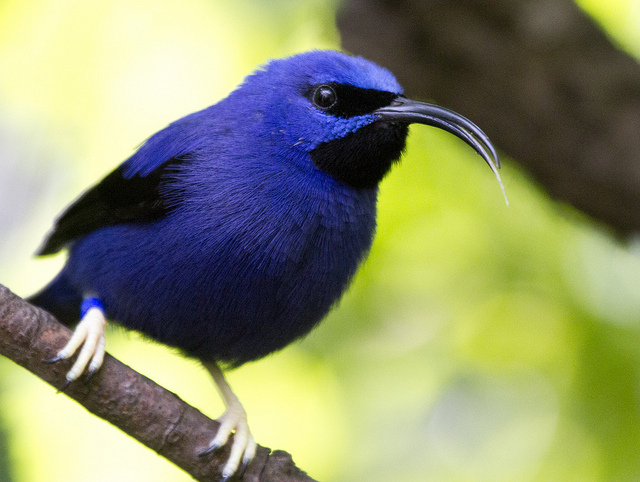 Purple Honeycreeper, another nectar-eating bird. 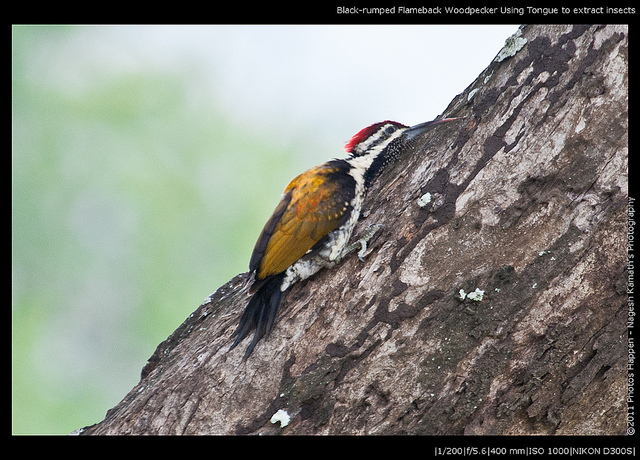 Woodpeckers need to be able to stick their tongues far out in order to get bugs out of holes in trees. Woodpecker tongues are sharp and spiky, and they use them like little spears to catch and eat their insect prey. 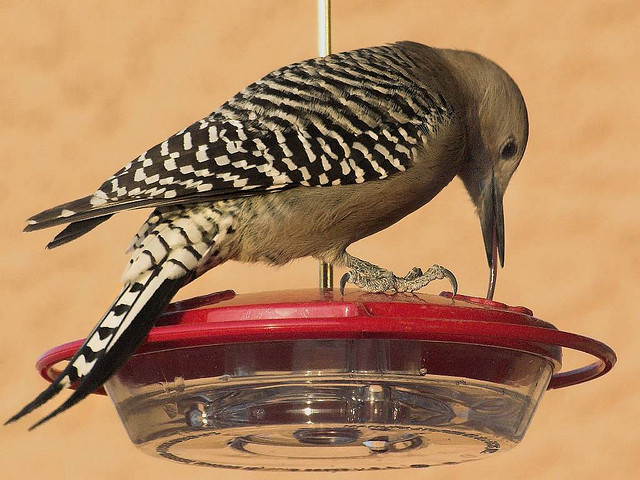 Or to eat from a hummingbird feeder. 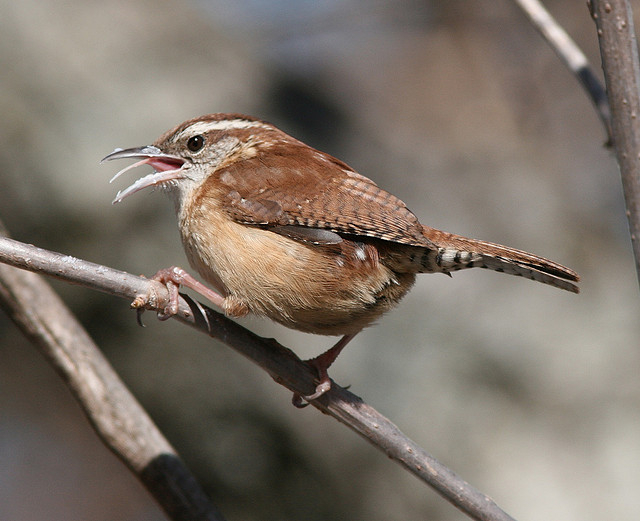 Fish-eating birds also have sharp tongues for hanging on to prey. Birds don’t have teeth, so if they want a sharp implement for handling prey, it has to either be on the bill or the tongue. 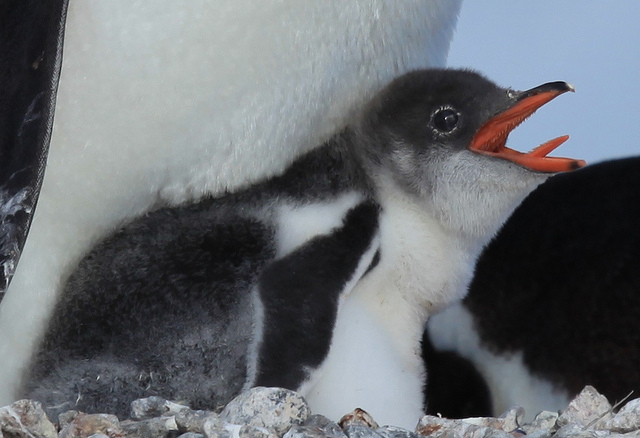 The tongues of fish-eating birds are often covered in little rear-facing hooks or spikes to prevent a captured fish from slipping away from them. 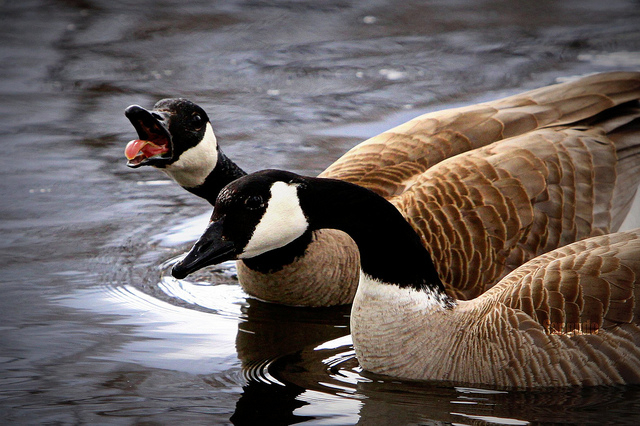 Geese and ducks also have spiky tongues, as well as hairy tongues and tongues with hard flat surfaces. There’s a lot going on in goose and duck tongues. Geese and ducks have tongues that look almost human-shaped from a distance, simply because their bills—into which the tongues have to fit—are shaped a bit like a human tongue, unlike the pointy bills of most birds. But if you get up close, you’ll realize that your tongue looks nothing like a goose’s. 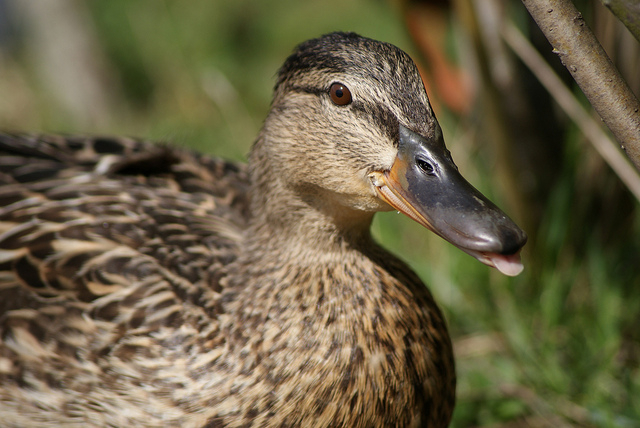 Hairs and spikes on the duck/goose tongue act like a sieve, allowing the bird to filter food particles from the water, somewhat like a baleen whale. The tongue can also be used to grip food: geese eating grass hold onto the grass by pressing it between the tongue and the top of the mouth. 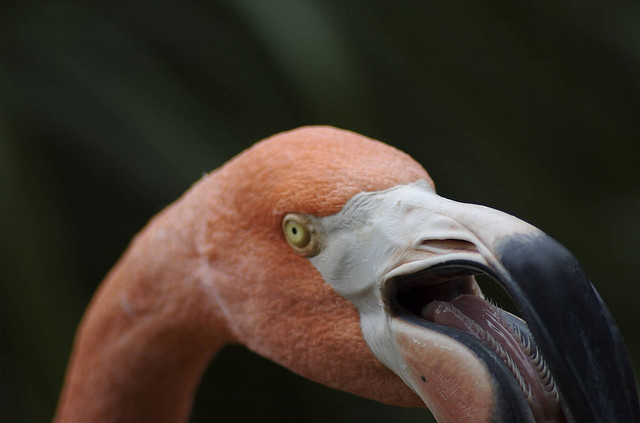 Flamingos also use hairs on their tongues to filter-feed. 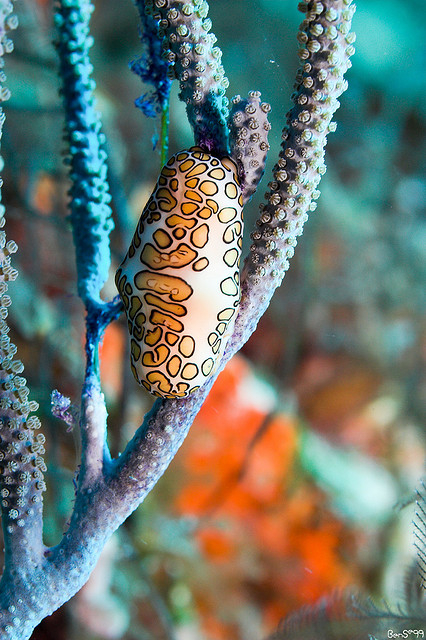 Flamingo tongue – no, wait, that’s not right… Oh, this is the Flamingo Tongue Snail. 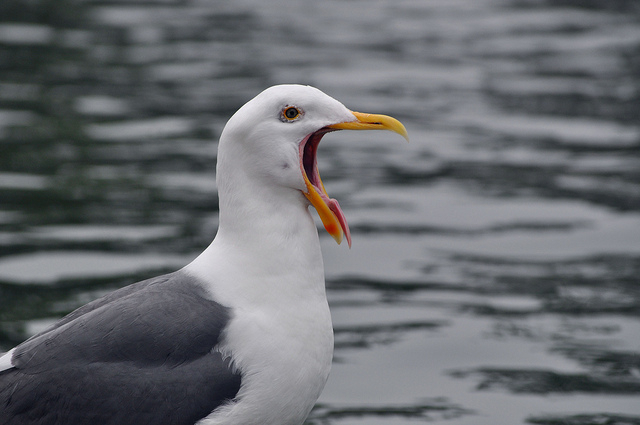 Not all birds have extremely specialized tongues. Songbirds generally just have triangular, not-too-crazy tongues, although they may have some small spikes or hairs to help them hold onto insects. 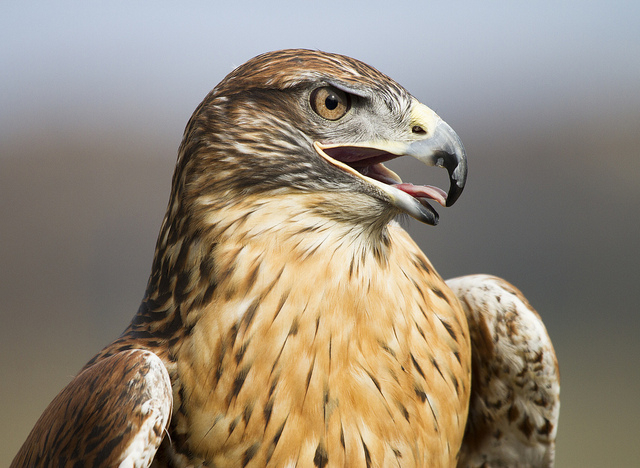 Raptors, too, have fairly simple tongues, with some small spikes or hairs to help hold onto prey. 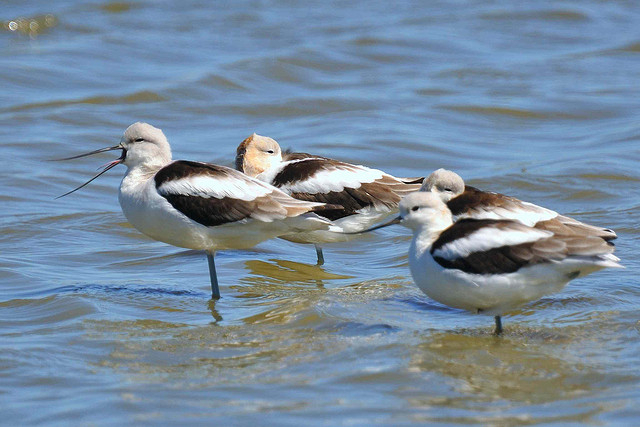 Shorebird tongues are so covered in tiny hairs that they have a “velvety” texture (Elner et al. 2005). 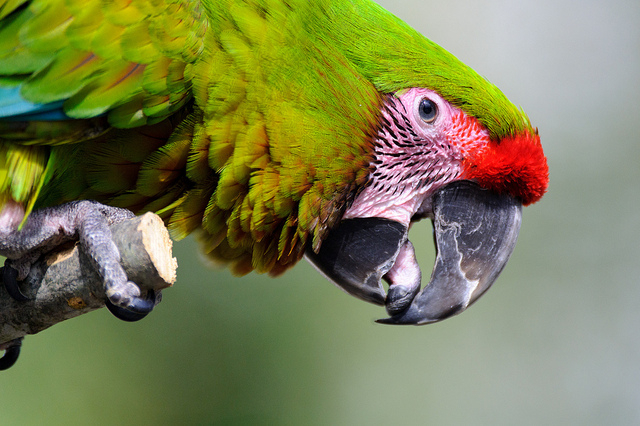 Parrot tongues are used to manipulate their food inside their bill. Although their tongues may look unimpressively blobby, parrots are unusual among birds in having muscles in their tongue, like we do. 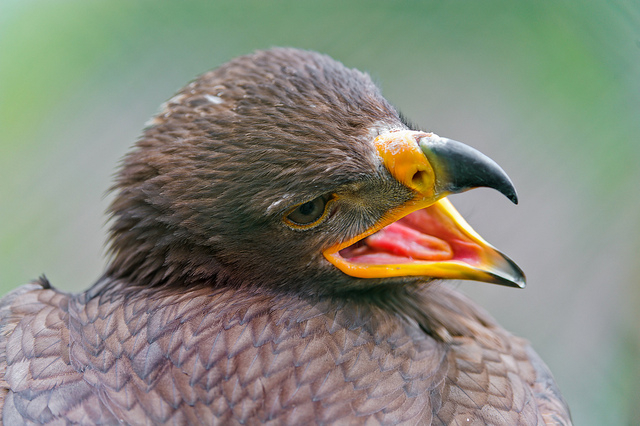 Most birds don’t have muscles in the front third of their tongue at all. I did not add that exclamation point; that exclamation point is quoted, along with the rest, from McCain (1973). But hey, can you blame him? Tongues are pretty exciting. Elner RW, Beninger PG, Jackson DL, Potter TM. 2005. Evidence of a new feeding mode in western sandpiper (Calidris mauri) and dunlin (Calidris alpina) based on bill and tongue morphology and ultrastructure. Marine Biology 146:1223-1234. Erdogan S, Iwasaki S. 2014. Function-related morphological characteristics and specialized structures of the avian tongue. Annals of Anatomy 196:75-87. McCain C. 1973. The tongues of kiwis (Apteryx spp.). Notornis 20:123-127. Rico-Guevara A, Rubega MA. 2011. The hummingbird tongue is a fluid trap, not a capillary tube. Proceedings of the National Academy of Sciences 108:9356-9360. 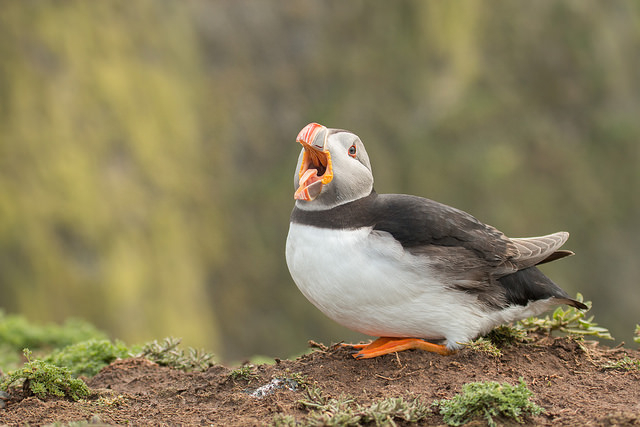 This entry was posted in general science-y stuff, miscellaneous, other people's research and tagged anatomy, animals, biology, bird, feeding, nature, tongue by toughlittlebirds. Bookmark the permalink. Amazing photos! Have you seen the ad for pistachios in which Stephen Colbert compares the pistachio in its shell to an eagle’s tongue while the Eagle eyes him with suspicion and slowly backs away? I’d never seen a bird’s tongue in an advertisement before. I had not seen that, but I’ve found it now! (Boy, apparently Colbert has made a LOT of pistachio ads.) It’s definitely… one way to look at pistachios. With all the different uses of tongues, it almost seems like human tongues are inadequate. But then again there’s that whole talking thing! Hi Katie, I met your parents and heard about your work and wanted to read your blog. I love it. Especially liked this one about tongues. I think science is calming and good for the nerves, whereas what I used to do — social work– is as interesting but hard on the nervous system. After my lifelong work with Feelings, I like reading about Facts. A friend of ours is an artist who loves drawing birds and in fact, late in life, is going to study them officially now. Check out his art on the web. He is Tony Fitzpatrick. Bats are my only reservation about calming facts…! Can’t warm to ’em! Terrific post! Bird tongues have always interested me. Especially those little barbs that get caught in mist nets! Very interesting articles, thanks. I’m writing from New Zealand, where you amy be aware we have a high level of endemic and endangered bird species; not least threatened by animals that have been introduced here from elsewhere. I’m writing on behalf of a website here in NZ called Pest Detective, designed to help people recognise the presence of introduced pest animals. 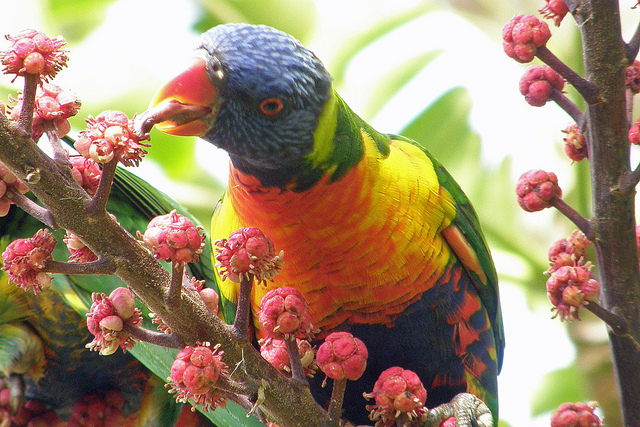 I would like your permission to use your rainbow lorikeet photo in this blog in a new section we’re developing on rainbow lorikeet, in case of wild populations establishing from escaped birds (as happened here on several occasions.) Rainbow lorikeet will compete adversely with our native birds if established here so. beautiful though they are, we would rather they remain only in their home country. If it is OK to use, woudl you let me know what acknowledgemetn you require and send a higher reolution copy? I look forward to hearing from you. Good luck! You’re doing extremely important work. Thanks, Katie. I’ll follow up on the photo and continue to read your posts with interest.